Art Auction to Benefit ASI at Anthropologie | Art Sphere, Inc.
ART AND RETAIL COME TOGETHER TO BENEFIT ART SPHERE INC.
With more than 185 stores worldwide, Anthropologie, known for their elegant and creative designs, is committed to improving and supporting the communities where their staff and customers live and work. On March 28 they will be holding an art auction to benefit Art Sphere Inc. 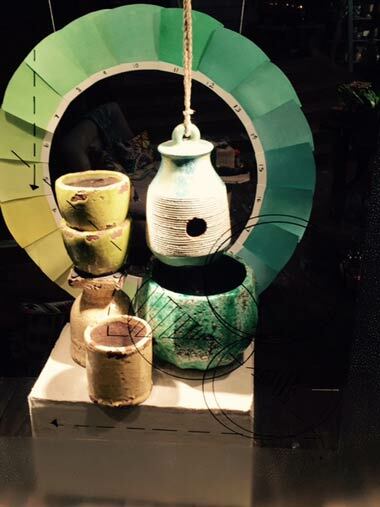 The pieces of art, originally in display windows, were created by artist and Anthropologie Senior Display Director Annalily Charles to reflect ideas of color theory. The public is invited to view the works of art and/or leave bids at the Philadelphia store at 1801 Walnut Street from 10 a.m. – 8 p.m. Customers with the winning bids will then be notified. According to Erika Lavinia, Anthropologie Display Director, “Artists throughout history have studied the power of color: what colors pair well together, how one color can affect another, even the feeling or mood a color can create. At Anthropologie this spring, we used our window spaces to pay homage to the beauty and complexity with color, looking at it from an artist’s perspective. This is not the first time Anthropologie and Art Sphere have come together to enrich the community. Volunteers from the store have helped clean up and renew the murals at the Fishtown Recreation Center and have worked with 3rd and 4th graders at the Adaire School to help them create vibrant murals to brighten the school. Philanthropie: Giving Tuesday | Anthropologie from Anthropologie on Vimeo. Art Sphere Inc. (ASI) founded in1998, provides meaningful art programs for underserved populations in an effort to engage the creativity in communities, empower neighborhoods, explore the positives in peoples’ lives, and heal the mind, body, and spirit through art. Working with hundreds of volunteers a year and partnering with numerous civic and governmental organizations, ASI’s grassroots mural painting and park clean-up events help support inner-city neighborhoods. In-school and after-school workshops lay the framework for art to nourish the character and development of youth, open up a new world of social engagement and reinforce the school curriculum. Share the post "Art Auction to Benefit ASI at Anthropologie"